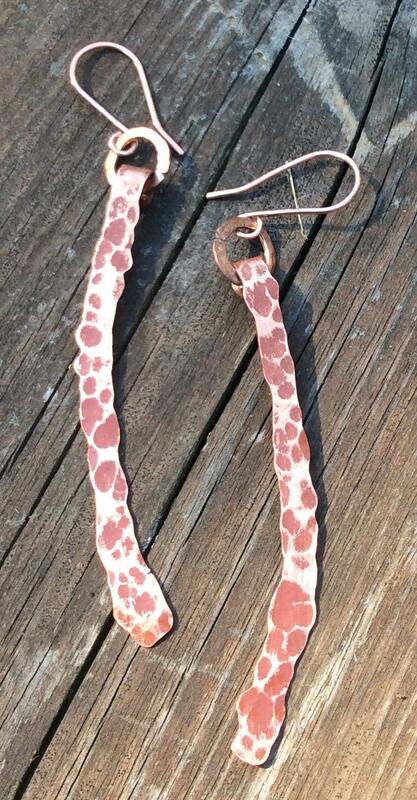 Using recycled bare copper wire, I made these lovely earrings. Fun and flirty with a bohemian / tribal look. These light weight earrings are great for year around fashion. I used 14 gauge wire. Hammered, shaped, sanded and cleaned to get this lovely texture. Then, I added patina, let it dry and then sanded away some to highlight the texture. I handmade the jump rings and eateries too. Earrings are 3 3/8" from top of the ear wires. If you find that these are a little too long, I can customize the length to suit your lifestyle, while maintaining the design. Just let me know!